UPDATE: Thursday November 8, 2018 - UCLA backed down on its cease and desist demands after receiving Palestine Legal and ACLU’s letter on behalf of SJP. SJP stands firm in its rights to advertise its conference with a bear holding a Palestinian flag, but agreed to remove the word “UCLA” from its poster because the conference location is obvious. The matter is not closed until UCLA assures SJP that it will cease its discriminatory treatment and protect the conference. LOS ANGELES — The ACLU Foundation of Southern California and Palestine Legal today wrote to the University of California Los Angeles to strongly refute the school’s claim that a bear logo used by a Palestinian rights student group is a violation of the Bruin Bear trademark. 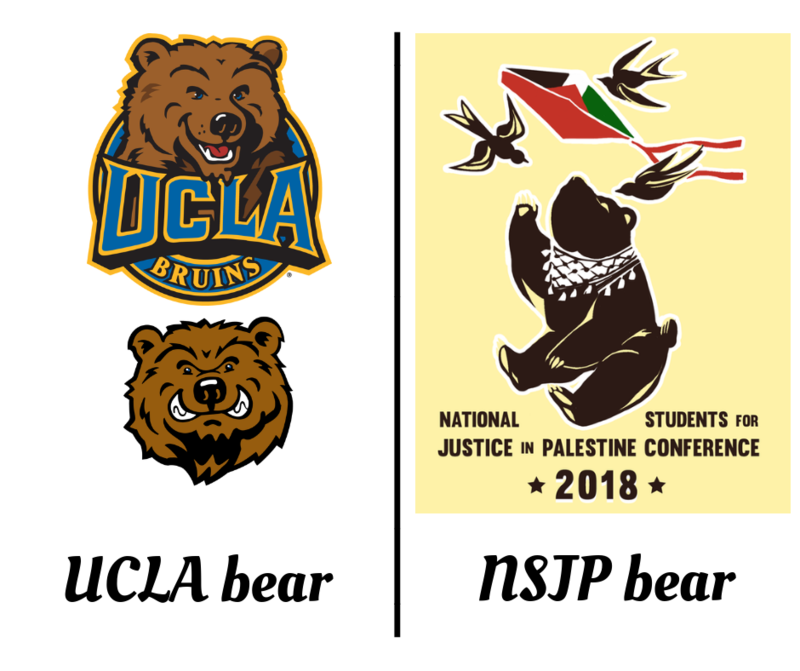 The bear image used by National Students for Justice in Palestine (NSJP) and Students for Justice in Palestine (SJP) at UCLA is featured in a poster advertising an upcoming conference. It does not remotely resemble the cartoonish Bruin symbol, sometimes shown carrying a football. The original artwork of the student group depicts a bear in a sitting position, wearing a keffiyeh scarf that is a symbol of Palestinian solidarity. The playful bear is gazing up at a kite, a symbol of freedom, bearing the colors and design of the Palestinian flag flying alongside three doves symbolizing peace. A comparison of the Bruin and SJP bears. On October 31, students organizing the conference received a legal threat letter from UCLA Vice Chancellor Michael Beck ordering them to “cease and desist” from using bear imagery. The letter threatened “claims” and “additional remedies,” including cancellation of the conference. The ACLU SoCal and Palestine Legal letter requests a response from UCLA by November 9, confirming that they will not be taking legal action against the students and asking them to create policies and practices to protect First Amendment rights. See comparison of Bruin and SJP bears here. Read the full letter from Palestine Legal and the ACLU SoCal here.